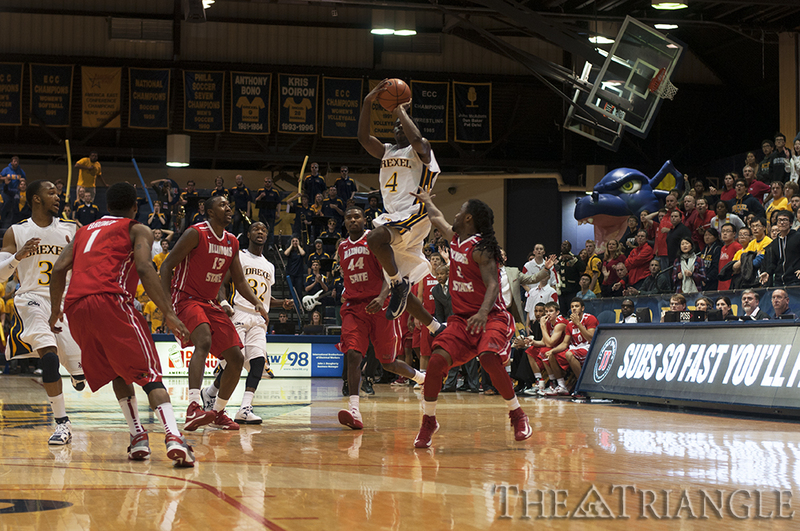 Drexel point guard Frantz Massenat goes up for a running jump shot in an 84-86 overtime loss last season to Illinois State University on Nov. 15. Massenat and the Dragons look to recover from a disappointing last season. Last season, Drexel’s Frantz Massenat was named the men’s basketball Colonial Athletic Association Preseason Player of the Year. Coming into his own as the best player on a team “destined” for the postseason, big things and increased production were expected from the point guard. During the year, Massenat took 43 more shots than he did the year before. With Samme Givens’ departure and Chris Fouch’s injury, the volume jump was to be expected. What wasn’t supposed to be part of that equation, however, was his low shooting percentage. Massenat shot 36 percent from the field last season, down seven percent from the season before. His three-point shot suffered even more. Where he shot a phenomenal 45 percent in 2011-12, Massenat only made 32 percent of his attempts from long range last season. His dropoff mirrored his team’s, as the Dragons went from a 29-7 record to a head-scratching 13-18. Massenat and the Dragons faced unexpected hardships last year, which led to unsuccessful offense from their point guard. This year they can fix that by leaning on their depth and spreading the offense around. With the return of Fouch, the continued development of Damion Lee, and the arrival of new guards Major Canady and Freddie Wilson, Drexel has a wealth of serviceable ball handlers. This newfound depth can give Massenat a breather and a chance at a fresh game. While Massenat struggled at some points during last season, a more consistent problem was an absence of sturdy offensive big men. Daryl McCoy and Dartaye Ruffin did not feature in the offense the way Givens did the year before, which led to the guard-heavy offense that Drexel ran for most of the year. But even when the big men took shots, the production was lacking. Last season, Ruffin — who this year is a senior and the team’s premier forward — shot 46.4 percent from the field. Only two other teams in the current CAA had one of their top two forwards shoot worse than 50 percent last season. It was a common thread. 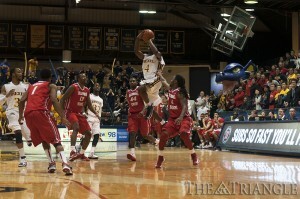 Last season, Ruffin often missed two-foot put-back shots and layups, the main course of his offensive repertoire. They may seem inconsequential at the time of the miss, but two-pointers add up. Out of 31 total games last season, the Dragons only won four of 12 games decided by five points or fewer. When you make layups like the ones Ruffin missed in tight games, the makeup of the contest is completely changed. You can’t get the ball that close to the hoop and not finish. Massenat, Ruffin’s roommate for the past two years, spent lots of time with the 6-foot-8-inch power forward over the summer. He said he and his teammates were upfront with Ruffin about what they need from him this season. Massenat also believes that fresh, athletic bigs like wiry 6-foot-9-inch freshman forward Mohamed Bah will help with the Dragons’ offense in the paint. Their post presence will be key; if Bah and Ruffin can put together a functional offensive attack, the Dragons will be the best offensive team in the CAA, plain and simple. A third problem the team’s offense faced last season was the frequency with which the offense simply stalled. Too often did the same situation occur: Massenat with the ball in his hands at the top of the key, searching for options with 13 seconds on the shot clock. Eventually he was forced to take an ill-advised or contested jumper because there weren’t enough options. Massenat never established an effective drive last season. In fact, no guards established a driving game last season. This season, with the return of Fouch, the Dragons’ offense will rely heavily on a successful three-point game. A key component of a successful three-point shooting offense is the drive and kick out to a spot shooter. Like Massenat said, he’s a true-blue point guard. His game is pass first, shoot when it’s necessary. Yet he has the scoring prowess to threaten opposing defenses when he drives; they know his left-handed finishing ability is a force to be reckoned with. The answer here is for Massenat — or Canady or whichever player is controlling the play — to establish a drive game early on in each contest. Being aggressive opens up a number of opportunities for points at the rim, and more importantly, for drive and kicks. When you have aggressive guards, they draw defenders from the arc, which will give Fouch and Lee more open looks for their three-point shots. This Dragons offense has unbelievable upside. In fact, it’s the exact same upside they had at this point last year. Luckily, they got a trial run and were able to learn from their mistakes as a team. The three mentioned here were the more glaring ones, but there is a whole slew of other improvements to be made. That said, if they’re all corrected by head coach James “Bruiser” Flint and his coaching staff, this offense is going to be extremely fun to watch this season.